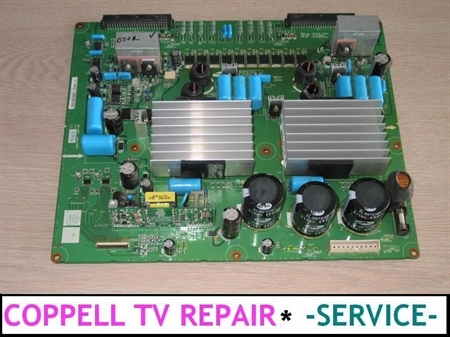 Coppell TV Repair offers a REPAIR SERVICE for your Samsung Y-Main sustain board LJ92-01275A / LJ41-03078A as shown on the picture. REPAIR SERVICE means that you have to send in your malfunctioning board in order to get it serviced and returned to you. We highly recommend that you send the two buffer boards sitting on the left side of the Y-Main LJ92-01275A and attached to it via the two black connectors and between each other with a white connector along with the Y-Main so that we test them as well. The testing will be done at no cost to you and significantly reduces the odds of failing the repaired and tested board upon its return and installation. Checking the buffer boards is essential part of a proper repair process of the main Y sustain board. Other vendors may announce it as a great free add-on to their servcice, but the fact of the matter is just that - it is essential for the proper repair process! That said and considering this is a listing for Y-Main LJ92-01275A / LJ41-03078A repair service only, we will still service said Y-Main board if you send it without buffers. But since we can not be sure they will not kill it (as has sure happened in the past) upon returning it to you we can not warrant its functionality once it leaves our premises. Once we service the sustain and test the buffers we will report status to you. Depending on what we find we may recommend replacement of the buffers or even require it in order to give warranty for the serviced Y-Main board. We do not offer warranty for this board unless customers order a pair of two new buffer boards to go with it. This is for the simple rason that a failed buffer board would often damage the Y-Main board this requiring its repair. That said, Y-Main boards also tend to develop issues on their own and they can fail without damaging the buffer boards, so often times we would receive a set of three boards where only the Y-Main board has failed and the buffer boards still work, even if old, worn and ready to fail. Buffer boards may also fail gracefully and not damage the Y-Main board; this is usually when they develop horizontal lines - pink/red/purpule ones, running from one side of the display to the other; when that happens the Y-Main board is not even bad, only the buffer board(s) need to be replaced. However, a shorted buffer board can and usually does result in a damage of the Y-Main board and we can not risk giving warranty to a set where one or both buffers are worn out and ready to fail. Hence we only warrant the repair we do if the Y-Main goes with two new buffer boards. We may make exceptions to that rule under certain circumstances and for certain frequent customers.